I was a Senior Computer Scientist at the NASA Ames Research Center, where I designed and managed the building of the Spacecraft System Integration Laboratory (SSIL) for the simulation of CubeSats orbiting in cluster formations and performing scatter-gather maneuvers. We installed Emulab locally in order to dynamically provision users with advanced graphics servers and up to 400 virtual machines in arbitrary user-specified network configurations. I also wrote software for the new Orion spacecraft that will someday take astronauts to Mars. 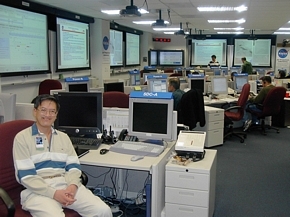 On an earlier mission, as Senior Scientist at the Research Institute for Advanced Computer Science (RIACS) at NASA Ames, I designed and led the development of the middleware for a key information management system for NASA's Mars Exploration Rover (MER) mission. I am the consulting Chief Data Scientist at Mediar, a data analytics startup. As a Research Staff Member at the IBM Almaden Research Center in San Jose, I helped implement the Splash software platform that integrated multiple heterogeneous simulation, statistical, and data models in order to research the nation's obesity problem. I was the Enterprise Software Strategist at the Lawrence Livermore National Laboratory for a major laser-based fusion energy project, the National Ignition Facility (NIF), where I helped design and develop a workflow system to consolidate and manage the scientific data generated by the laser firings. I've worked at high-tech companies such as Hewlett-Packard, Sun Microsystems, and Apple as a software developer, project lead, and engineering manager. I am an inventor on six U.S. patents. The first two are for innovative web techniques at an early Internet startup. The most recent four are for advanced data analytics at IBM Research. I have invited and hosted pioneers in computer science and in the computer industry, including several Turing Award winners, to give weekly talks at SJSU. I have taught software classes at Stanford University and at Santa Clara University, and I had a faculty appointment at the University of California at Santa Cruz. I have degrees in the Mathematical Sciences and in Computer Science from Stanford, where two of my physics professors each had a Nobel Prize. But despite having done work that required taking the Theory of Relativity into account, I'm still amazed that the sun comes up each morning and that bicycles don't tip over. I've written books on compiler writing, software engineering, and numerical computation that have been translated into several languages. I coauthored the chapter "Compilers and Interpreters" in Computing Handbook, 3rd ed., and I wrote the chapter "A Highly Reliable Enterprise System for NASA's Mars Rover Mission" in Beautiful Code which won the Jolt Award. I find designing and developing software such as compilers and enterprise systems to be fun and challenging. So I'm the kind of geek nobody	wants to talk to at parties. My one redeeming feature is that I am owned by cute cats.